NES Solitaire (USA) in 00:38.05 by TheRealThingy. 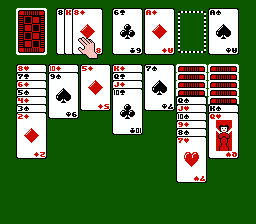 Solitaire is a family of single-player card games. The particular form featured on the NES is called Klondike, and you can find it distributed with many desktop operating systems, such as Windows. This run improves the previous one by 4 seconds.